Thanks, Fuelshark! Or was it the fact that I DD a car for the first time in my life? No, I haven’t bought one of the worst scams in automotive history, but I did finally take my CTS out for a round trip to Columbus, Texas and back to meet my parents for lunch. In my old F-150, this jaunt would have gotten me about 14 MPG (5.4 Triton V8 plus 4WD), but averaging 73 MPH on the highway got me 25.2 with the 304 horsie Direct Injected 3.6. 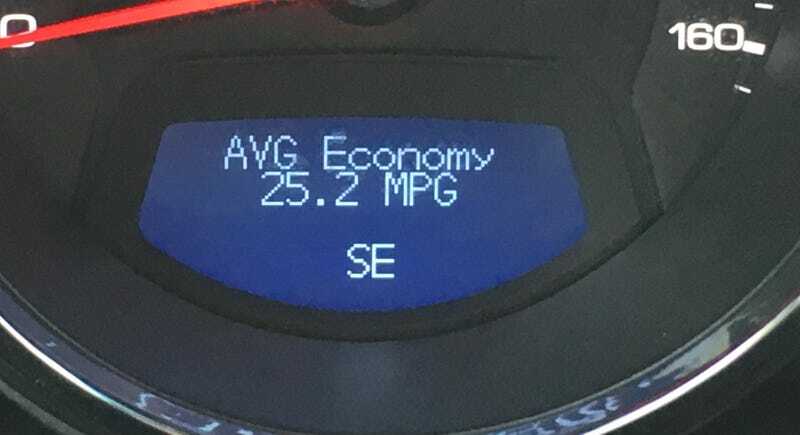 The funny thing is that, even averaging a speed higher than most limits on most highways in the nation, I still ended up with a fuel economy greater than I’ve ever accomplished in my life. The closest thing I’ve ever gotten to this was 18 MPG going about 60 between Austin and Houston (going slow because I had mattresses in the bed of the truck). I could get used to this whole car thing.